Published: May 21, 2014 at 03:15 p.m. Updated: May 22, 2014 at 10:58 a.m. 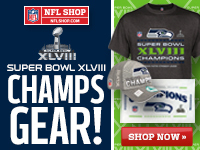 The 2013 Seattle Seahawks used their underdog status as a rallying cry in their run to a Super Bowl title. During the team's celebratory visit to the White House on Wednesday, President Barack Obama explained why he related to "the best football team in America." "As a guy who was elected president named Barack Obama, I root for the underdogs," Obama said from the East Room of the White House. "So seeing folks overcome the odds excites me, but it also excites me when you see the whole being greater than the sum of its parts." In a nice break of tradition, Richard Sherman presented Obama -- not with a Seahawks jersey -- but with a Seahawks "12" flag that became ubiquitous during Seattle's title run. A nice touch by a team that will be remembered. » Obama: "I considered letting Sherman up here to the podium today. Giving him the mic, but we gotta go in a little bit." » The famously media shy Marshawn Lynch did not make the trip to D.C. with teammates. Said Obama: "I am sorry that Marshawn's not here because I just want to say how much I admire his approach to the press. I wanted to get some tips from him. It's about the action." Big laughs on this one. » Obama on the Seahawks' renowned home-field advantage: "You all have that stadium that is kind of cheating because it's so loud. (More laughs) You hired some physicists to make it so ... there are a lot of really smart people at Microsoft and up in those places that can design these things." » Seahawks coach Pete Carroll, who spoke after Obama: "Thank you Mr. President. I can't believe I'm saying that."